The New Year so often means resolution to change. Change is good. The only things that don’t change are dead things. Well, dead things do change but it’s not what most living things are looking for. 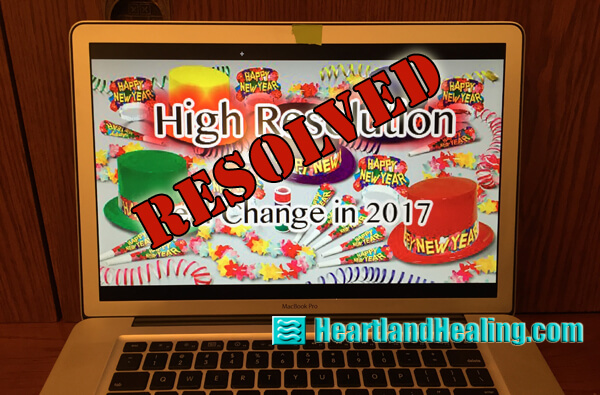 If you read last week’s Heartland Healing, you’ve been reminded that all change starts with thought. Further, we noted that of the two parts of the mind commonly understood, the subconscious is the most powerful. And that its intellectual counterpart, the conscious, analytical part of the mind, — that babbling font of 50,000 thoughts a day, most of them unnecessary, counterproductive and intrusive — has to be brought to rein before we can successfully enact the subconscious. We offered a couple tips to experiment with quieting the drunken monkey. Deep Space. Once the conscious mind is quieted, the subconscious is more accessible. Bear in mind that nearly every vital function of life and every activity is affected by how we use the subconscious. That’s why every successful athlete uses techniques to help them perform amazing athletic feats. Like Hall of Fame baseball player Yogi Berra once said, “Baseball is 90 percent mental and the other half is physical.” But it’s not just athletics that is a perfect target for the subconscious. It’s everything else in our lives. Our health, our success, our behavior, our relationships, even how others see us and treat us is affected by the thoughts that exist deep in our subconscious. Engaging. The subconscious is accessed in many different ways. The most common are, in no particular order: repetition, influence by authority figures, hypnosis or trance states and impactful or traumatic events. In any case, it’s necessary that the conscious mind be relaxed. Then it’s much easier to access and influence the subconscious with intent. Repetition: This is a common way to engage the subconscious. Everyone who drives a car or plays an instrument or sport has done this. All of us have repeated something in order to commit it to memory. Repetition does two things: it eventually distracts the conscious mind and also embosses the subconscious. One way to apply it to a desire for change is to use written affirmations. Writing out longhand a positive (affirmative) version of a goal is the key. The subconscious doesn’t hear negatives or positives. It’s nonjudgmental. So if you repeat to the subconscious, “I won’t smoke. I won’t smoke. I won’t smoke,” what that subconscious is hearing is “I smoke. I smoke.” A better approach would be, “I breathe free and easy,” or “I enjoy fresh, clean air.” A person knows what will work best for them so just use that format and find your own affirmation. Write it a few hundred times at a sitting, maybe twice a day for seven days then rest. Visualization: The subconscious is the part of the mind that existed pre-verbally, before we learned to speak or use words. Its language is imagery. As an infant, we learned and imprinted by seeing things. It’s no different as an adult. That’s why athletes use visualization. Again, the imagery should embrace the positive outcome we seek and not the means of achieving it. We should see in our mind’s eye the event as it should be after we have achieved success. You want to train the subconscious to reach the goal, not the means. Hypnosis: A properly trained hypnotherapist is an excellent way to access and use the subconscious. That doesn’t mean psychologist or psychiatrist or counselor. Although one of those could possibly be qualified, it’s a challenge for such practitioners to set aside conventional prejudices toward the more abstract metaphysical applications of hypnotherapy. I have found that the most accomplished hypnotherapists have the ability to evoke clear and poetic imagery that draws the subconscious into a scene or script much as a screenwriter or novelist would. Of course there’s much more to hypnotherapy than that but creating imagery is an important skill. Goal Setting: Before one uses any method to engage the subconscious as the engine of change, it’s crucial to be clear on the goal. Misplaced intention will serve no use. To cite one example, a woman once came to me for hypnotherapy. As I always did, I asked, “What’s the problem?” She answered that she needed to improve her financial situation, so that was her goal. In exposition, she revealed that the reason was that she wanted to have enough money to buy a house in the country to raise her two children. So the flaw was obvious. Her goal in mind should have been the house, not the money to buy it. I pointed out that the number of ways to reach that goal, to have a house in the country to raise children, is infinite and not limited to having the money. Being clear on the goal is important. To translate to a current issue, some folks are worried that the new Administration is a threat to reversing global warming so they lash out at Donald Trump. If the goal is to impugn an elected official, then that is well played. But if the goal is to reverse climate change, take better aim. Work to accomplish that goal not to protest a person. Creating positive change in health, our planet or our behavior is effectively achieved by engaging the best tool we have and that’s the mind.